Billboard campaign launched by the Zionist organization Im Tirtzu calls on Israeli government to end all cooperation with NIF. A new campaign launched by the Zionist organization Im Tirtzu is calling on the Israeli government to end all cooperation with the New Israel Fund. 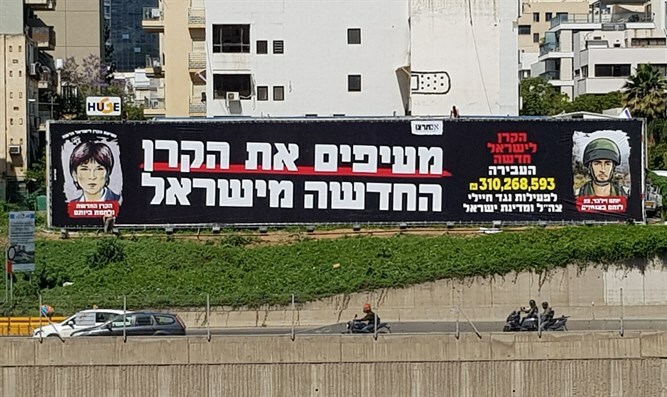 The campaign will see billboards titled "Ridding Israel of the NIF" displayed throughout the country, the first of which, a 100-foot sign, was displayed this morning on Tel-Aviv's Ayalon Highway. The billboard depicts NIF President Talia Sasson as harming IDF soldiers, and states that the NIF has transferred over 310 million NIS ($87 million) to "activities against IDF soldiers and the State of Israel." According to Im Tirtzu, the campaign's goal is to expose the NIF as a foreign political organization operating as a political opposition within Israel against the government and IDF, while engaging in anti-Israel lawfare by means of its grantees in the Supreme Court. At the same time, Im Tirtzu published a new position paper detailing what it dubs the NIF's M.O. in wiping Israel of the map. The position paper, titled "The Roadmap to Israel's Destruction," comes in the form of an Israeli map and accuses the NIF and its grantees of exploiting various issues in the country in order to accuse Israel of perpetrating war crimes, ethnic cleansing, apartheid and other crimes against humanity. The report also notes how many NIF grantees receive extensive funding from European governments, the European Union and United Nations. According to Im Tirtzu, its decision to launch the campaign came following the NIF's subversive efforts to torpedo the government's plan to remove thousands of illegal migrants, as well as the recent wave of petitions by NIF grantees against the IDF. In response to the Gaza riots, a number of NIF-funded NGOs petitioned the Supreme Court against the IDF with the demand that it change its rules of engagement in dealing with the rioters. Im Tirtzu CEO Matan Peleg called it "absurd" that government ministries and public institutions continue to cooperate and hold events with NIF grantees. "There is no parallel to this phenomenon in the democratic world," said Peleg, "where a foreign political organization openly declares that it represents the political opposition in its host country." "This unique problem, coupled with the fact that the NIF transfers millions of dollars to NGOs that work to slander the IDF, erase the Jewish character of the state, and petition the Supreme Court against state policy, leads one to the conclusion that the government must cut all ties with this insidious organization." "We hope," added Peleg, "that our elected officials will adopt this approach and work immediately to implement it."